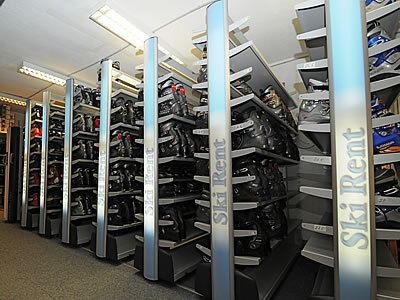 Standard ski boots are especially suitable for beginner and low intermediate skiers who have (as the name suggests) roughly standard sized feet. Standard ski boots have moved on far from when they were uncomfortable shells - but they offer fewer adjustments than premium boots. Premium ski boots are not just suitable for good skiers - premium ski boots normally offer a snugger and more precise fit and are especially suitable for those with feet and calves which are particularly large or small. Ski boots designed by the same manufacturers as our full adult range - but in smaller sizes. Our boots for older children and teens are specially designed for this intermediate sizing. Suitable for children of ages up to and including 14 years of age. These boots are also designed by the same manufacturers as our full adult range - but are adapted for the lower skills and comfort levels of smaller children and toddlers. Suitable for children of up to and including 6 years of age.